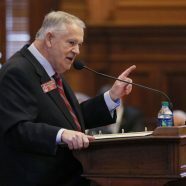 The Republican Speaker of the Georgia House of Representatives, David Ralston, needs to set an example of how Conservatives should behave in office – and because of past actions David Ralston, the current Speaker, needs to step down from his position. And at 9 Republican grassroots meetings in March 9 counties including Coweta, Cherokee, DeKalb, Gwinnett, Bartow, Fayette and Camden passed official resolutions saying so. In fact, in the past two years, the Speaker has used his legislative privilege to delay justice in at least 21 court cases in four North Georgia counties through 57 separate court date extensions, 81.7 percent of which were granted for dates outside of the legislative session. We in the 98th District are proud that our Representative, David Clark, has stepped up and authored a resolution (HR 328) encouraging the Speaker to give that very important position to someone else. As Republicans, I believe we must show that we are willing to stand up and speak out when our own get caught up in activities that do not uphold our core values. Our Republican members need to be examples and role models. Representative Clark certainly did not take this action lightly – in fact, he with the Speaker privately and could not get answers to specific questions on this issue. He is really putting everything on the line to stand up for the people who have been hurt by Rep. Ralston’s actions. Fortunately, several other House members have been principled enough to join him. But Rep. Clark is now facing childish behavior from many Republican House members who would rather stand with a bully than stand on principle. But just like he did when he was on active duty in the middle east, David is not backing down. In five years he wants to be able to look back and tell people that he was willing to take a stand for those that could not fight for themselves. And there will be more of these tragic stories to come. Rep. Clark has had people contact him explaining how Ralston’s tactics have enabled those accused of crimes to live free and avoid their day in court. One man even stated that everyone knew that if you didn’t want to be convicted, just pay Ralston $20,000 and your case would never go to court. The AJC is now investigating even more cases of abuse. One more word before I go – Ralston is now saying he will take no new clients until these old cases are closed out and he promises to be a good Speaker in the future. Many conservative representatives are using this a reason to excuse his behavior. But most of us know he is ONLY changing this practice because he got caught. If the AJC hadn’t uncovered this, it would be business as usual. And we have to wonder – how many other things are there that have not been discovered? Please take just a minute and call or, even easier, email some of the Republican Representative at the State House. If enough of us do this I promise it will have an effect! This is a House Resolution, so it was not affected by Crossover day. A Resolution only has to pass one chamber, so if the House Leadership lets it come up for a vote then it could pass in the next few weeks. Below is the basic contact info for the current Republican House Members. Members who are supporting the resolution, as of this writing, are Kevin Cooke, David Stover, Jeff Jones, Sheri Gilligan, Ken Pullin, and Karen Mathiak. But David needs 91 to join him! While you are not my Representative, I have had the pleasure of speaking with you several times and based on those conversations and your work in the House I am confident that you are a man of integrity. So I am asking that you please help my Representative, David Clark, and join him as a sponsor of his resolution 328 to encourage David Ralston to resign his role as Speaker. As Republicans, I believe we must show that we are willing to stand up and speak out when our own get caught up in activities that do not uphold our core values. Our Republican members should be examples and role models. David Clark met with the Speaker privately and could not get answers to specific questions on this issue. He is really putting everything on the line to stand up for the people who have been hurt by Rep. Ralston’s actions. Fortunately, several other House members have been principled enough to join him, and I hope that you will consider helping him out in this effort as well. What David Ralston has done and is doing now for many years may not be illegal, but it’s incredibly immoral! He is a stain on Ga. He needs to go!!! Obstruction is against the law, regardless of who you know! Time to start circulating the Recall Statute for Mr. Ralston and anyone who supports his action is surely complicit. The actions of David Ralston were seriously unethical as an officer of the court. Delaying justice for victims was unconscionable. Delaying cases for a hefty fee to ultimately gain a result of a not guilty outcome for a DUI case is unethical as well.